Alright, Folks, it’s time for another outdoor safety post. Spring is hopefully right around the corner and where I come from we’ve been getting a lot of cold, dreary rain. Although thunderstorms tend to show up a bit later they can occur at any time and this rain has put them on my brain. I do enjoy thunderstorms much more than this dismal weather we’re having however, it will hopefully be no shock (pun intended) to you that they can be a lot more dangerous. Thunderstorms mean lightning, which is one of the leading causes of weather-related death and injury in the US. So let’s talk about lightning safety in the outdoors. Lightning is actually very interesting. In this post, we will not only talk about how to protect yourself from lightning-related injuries in the backcountry, but I’ll also try to throw in some interesting facts that you may not have known before. Lightning is a massive discharge of electricity. This electricity is actually built up as ice crystals within a cloud bump into each other. Each bump creates a bit of electrical charge. 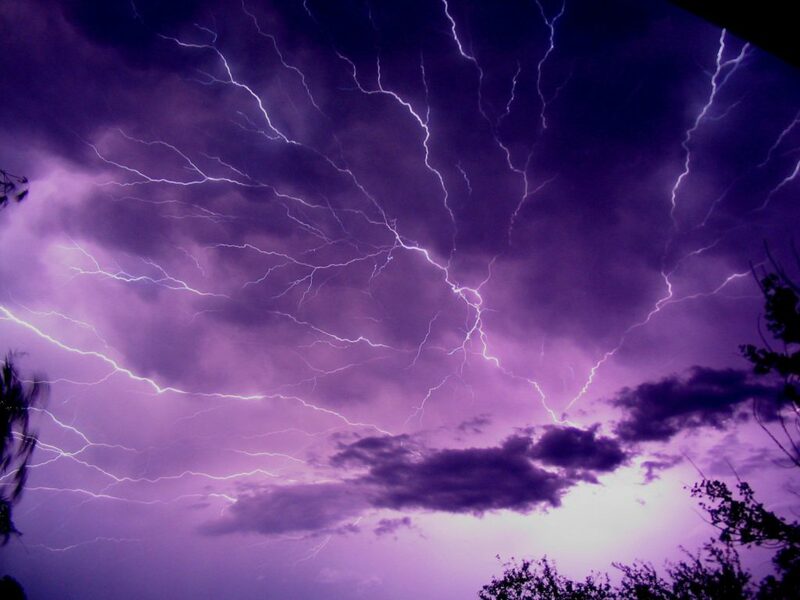 Most lightning never actually leaves the cloud but if enough positively charged particles on the ground attract the built-up negative charge in the cloud. 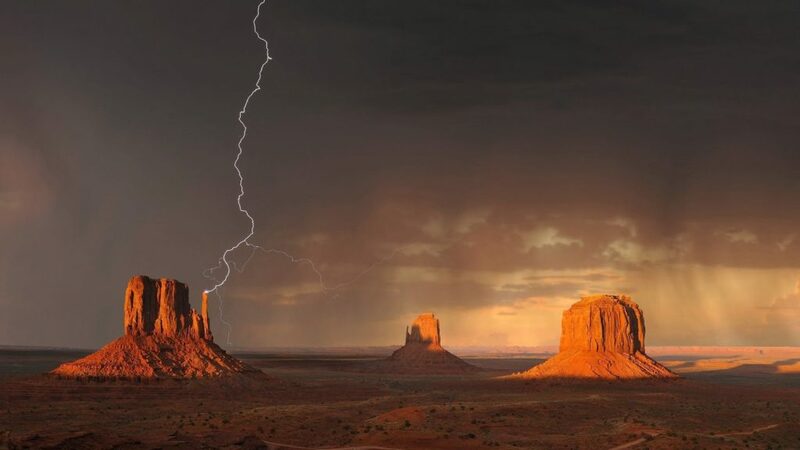 A giant spark will occur between the two, and that’s when we see lightning connect with the earth. Why is this important to us? Well, we don’t want to contribute to the positively charged particles that attract a direct strike! How can it “strike” me? These are the most significant lightning events and can carry 30,000 or more amps. They can reach over 5 miles in length and can raise the temperature of the air by 50,000 degrees F. Pretty powerful stuff. Direct strikes most often occur directly beneath the thundercloud however they can randomly strike horizontally up to 10 miles away from the storm. But, contrary to what you may think, direct strikes (although very dangerous) are not the only, or even the most common, hazard associated with lightning. These account for nearly 50% of lightning-related injuries. When lightning strikes the ground, it pumps electricity into the earth. The earth resists electrical flow so the ground current diminishes as the distance from the strike increases. The danger comes when a person is connected to the ground by two (or more) points of contact. The greater the difference in electrical current between these two points the more dangerous the currents that will be driven into and over a person’s body. If you stand with your legs spread out or lay down, this increases the potential ground current difference. Farm animals like cows are vulnerable to ground currents because of their wide stances, and many are killed from lightning each year. Stepped leaders are electrical currents that move down from the cloud as they are attracted by positively charged streamers moving up from the tops of elevated objects. When streamers connect with leaders this results in a direct strike from cloud to ground. If your hair stands up, this is a sign that you are part of a streamer current. This means you are in imminent danger of a direct strike and the streamer current itself carries enough charge to cause injury or death. Similar to ground currents, there is a large change in field currents around the strike point. These differences can drive currents across your body that can disrupt heart rhythm. Apart from actually striking you, lightning is very loud and very bright which can damage hearing and vision. Hopefully, you now understand the danger of lightning and aren’t too terrified by it that you never want to go outside again. Luckily for you, there are many things that you can do to protect yourself from lightning danger. If you’ve read any of my other safety and survival articles you already know that I’m a strong advocate for proper planning. You should never enter the backcountry without checking and rechecking the weather as things can change quickly. My personal favorite way to check the weather is with the Weather Underground and Storm Radar apps. I have found them to be detailed and very reliable. Know what you’re getting into, the chance of a storm and whether you’re willing to tolerate the risk. If the risk is low and you decide to continue with your trip, plan for what you will do if a thunderstorm does happen to arise including possible areas to take shelter. Are there buildings nearby? Will you be able to retreat to your car quickly? Plan to turn around and get to safety as soon as you hear thunder. If you can hear thunder it means you are close enough to get struck. Stay indoors until thirty minutes have passed since the last thunderclap. What if I do get stuck with no shelter? Planning ahead is the biggest and only way to significantly protect yourself from lightning-related injuries because the only way to stay completely safe is to stay indoors. Staying inside a car with the windows up is also somewhat safer than being outdoors. If either of these is no longer an option, there are some things that will slightly decrease your risk of being struck, but understand that once you are in this situation there is absolutely no way to eliminate the danger. There is an element of randomness in lightning strikes so doing these things may lower your chance of injury but they will NOT make you safe. When you are the tallest thing around, such as in an open field, your risk of a direct strike is increased. Also, avoid areas that tend to attract lightning such as mountain tops or tall isolated trees. Things that are highly conductive such as water and metal objects. Long items such as wet ropes can be especially dangerous because they will conduct the electricity easily and increase the danger of ground currents with high voltage differentials. Removing metal from your person, like a belt buckle, can help you avoid getting burnt. Group members should move away from each other to avoid currents from traveling between people. If the storm is upon you and you are exposed to lightning, get into the lightning position. Squat or sit with your feet close together and your arms wrapped around your legs. This does a couple of things for you, it lowers your chances or sending out positively charges streamers and attracting a direct strike. Keeping your feet close together also lowers the risk of dangerous ground currents entering your body. If you have insulated objects like a foam camping pad, stand on top of it. Stay in this position until the lightning passes. Lightning is suspected to have jump-started life on earth. The heat and energy from lightning strikes are able to convert elements into compounds that are essential for living organisms. 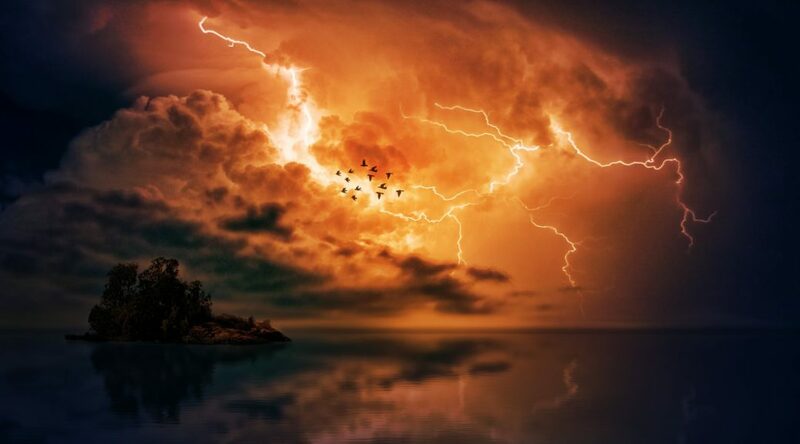 The Earth is struck by around 100 lightning bolts every second! Apart from thunderstorms lightning can be generated by volcanic eruptions, intense forest fires, and nuclear detonations. You can tell how close a lightning strike is by counting the seconds between the flash and the sound. Every 5 seconds is equal to one mile. I personally think that lightning is a beautiful weather phenomenon and the thrill of a thunder crash sets my heart racing. But I prefer to see and hear it from a place of safety. So be safe out there guys. Please plan ahead and make smart choices with regard to lightning situations. Most victims of lightning strikes survive with proper treatment, including CPR if necessary, however, the long-term effects can be terrible. Let’s all avoid it if we can! If you’re looking for more information on lightning safety the National Outdoor Leadership School has some excellent guidelines. Click here to read them. If you like learning about outdoor safety you may also enjoy this one about bear country, or this one about flash flood danger. As always, if you have any questions, comments or concerns leave a comment below and I promise I’ll get back to you! Nice tips on how to protect ourselves in the lightning. A really informative post. I was not aware that lightning events can be so powerful and at the same time so dangerous as it can damage hearing and vision. As you rightly mentioned, proper planning is necessary, as weather can change at any given times, especially in the backcountry. You mentioned insulated objects can help you in this situation, can you please suggest which is the best-insulated object we should carry while outing? We shouldn’t plan to carry a specific object to insulate us from lightning because we should instead plan ahead in order to avoid any situation where we might need it. If the crap does hit the fan and despite your best efforts and planning you find yourself directly in the lightning zone a foam sleeping pad, shoes with thick rubber soles or something along those lines can slightly help lessen the risk of injury from ground currents. I like to watch those shows on TV to do with storms and dangerous weather caught on camera, every time an expert comes on they always say that it’s rare to be hit by lightning but it does happen and is incredibly dangerous! I’ve heard that proper footwear can help reduce the chances of getting hit, do you think that’s true? And, if it is true, what type of shoes would you recommend to someone in storm territory? The chance of you getting hit by lightning in your lifetime is about 1 in 3000. So pretty rare but it definitely happens! Proper footwear can slightly help insulate you from the ground currents (same with standing on a foam pad or something similar.) But it’s much better to keep yourself out of situations where you need to worry about insulating yourself from the ground in the first place. There is no specific type of shoe, but thick rubber soles are better insulators. Very good information on lightning. Some years ago, some scouts were camping in Yosemite Park. A lightning storm went through the park. The scouts were told to get in their tents, possible having the sleeping pads you mentioned. One of the boys decided to look out side. When he touched the metal zipper he was shocked an lost his life. I have never heard of using the sitting style (fetal position) to make your contact with the ground smaller. I like the information. So making less contact (width) with the ground will lessen the amount of current going through you? That’s very unfortunate, about the scouts. Tents offer absolutely no protection from lightning. In fact, tents are even more dangerous because they are built with long metal poles which conduct lightning. To understand better how keeping your feet close together will help lessen the risk of ground current shocks check out this video: NOLS MythCrushers Episode 3: Lightning. You can start at about 2:23 to skip straight to the ground current portion. Personally, I never knew of the ground currents before reading this article. I always thought lightning strikes were always direct. I’ve also always wondered what to do if you’re caught out in the wilderness during a lightning storm, especially when there’s no shelter around. Now that I have a few tips, I might take a few more risks and hike in the spring and summer during times where the weather seems ominous! I think you may have misunderstood the point of this post. If you get caught in a lightning storm anything that you can do at that point will only slightly lessen your risk of a lightning injury or death. The whole goal is to not get stuck in a situation in which you need to assume the lightning position. But if despite your best preventative efforts, you do then you at least know might help you. Just read through your page, some great information on here. Would you recommend any footwear to UK visitors in case of lightning strike/ storm? Here in the UK, we have lightning but nothing compared to other countries. We do get trees and power lines falling as a result, but this is very very rare. The benefit of any specific footwear is quite negligible when it comes to lightning safety. The best thing to do is to get indoors and stay there until the storm has passed. When planning a trip into the backcountry you should be aware if lightning is a possibility, and be prepared to turn around and immediately get to safety when you hear thunder. If despite your planning and good decision making, this is not an option and you can’t get to safety at all, then you should follow the rest of the instructions in this article. Thick rubber soles can help insulate you from ground current strikes but, it is by no means a guarantee of safety. Hi Mariah, I remember as a child, I used to be mighty afraid of lightening and thunderstorms. Your article made me to reminisce on my actions as a kid. I have actually learnt a lot about lightening from your article, especially the streamer currents. Thanks for your tips on how to avoid the danger of lightening. Planning ahead, is the best option to avoiding the effects of lightning. You’re absolutely right Gracen! I hope you will plan lots of good, safe adventures! Although most lightning occurs in the summer, from experience I know that people can be struck at any time of year. I once knew of a man that actually got struck by lightning during a snowstorm. I’m glad you included information about ground currents. Because ground current strikes affect a much larger area than the other causes of lightning casualties. It is very important that people know about them and how to protect themselves. Thanks for putting this information out there to help keep people safe! Yes, thundersnow storms are a real thing. I have actually experienced one and it was scary and weird. Thanks for reaching out. Hi! I can’t agree more with you concerning proper planning. Thank you for recommending the Weather Underground and Storm Radar apps. I’ll download them right away. Thank you for also giving the suggestion of staying inside the car with windows up if a thunderstorm catches us. I also found useful your tip of standing on top of a foam camping pad if we can’t run to a shelter. Thank you very much! Hi Henry! I’m glad my article was helpful to you! This article is educative and helpful. I know now the meaning of lightning and its causes. 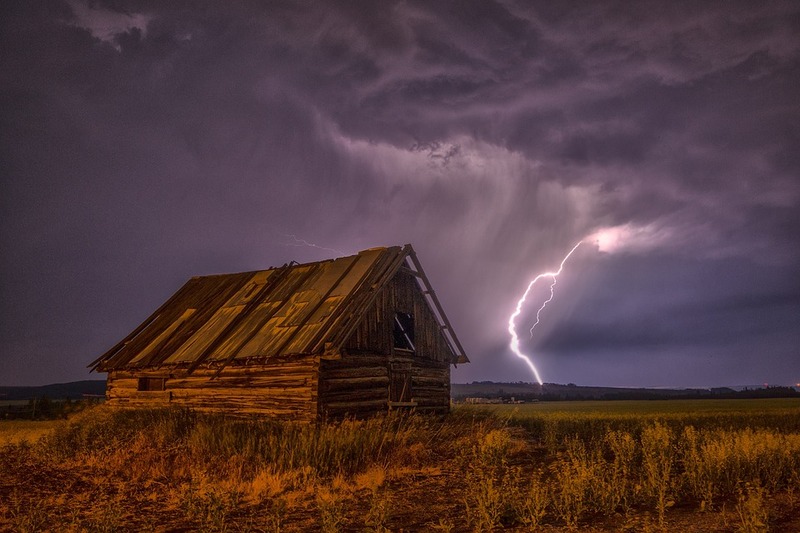 What I learned about lightning in this article is a treasure to me because I can say I know how to avoid its deadly strike and I am going to teach my friends and loved ones what to do when it comes to lightning. Thank you for this wonderful information. I’m glad it was helpful for you! Feel free to share the article with others. I must say that this article is very helpful and informative. It is not rare to hear that some folks died because of lighting and it is pretty dangerous. Just to say, my neighbor died because of it 4 years ago as he was close to the tree and it literally burned him. I prefer to not go out when I see the weather like that. Smart choice Daniel. It’s tragic about your neighbor. Sadly, there are many misconceptions about lightning that actually make things more dangerous for people. Like going under a tree to shelter yourself from the storm. Thanks for this informative review on lightning, I have always been scared of lightning from a tender age till now as a grown up and always find myself in panic mode when ever it rains heavily, thanks to this amazing post which brought me a solution to always plan ahead to avoid been struck by lightning. Thanks for the safety tip, I find this very helpful. I like to travel a lot but I mostly avoid camping or doing a picnic during the period before raining because usually, lightning at this time will be a lot due to the gathering of the cloud. But if one day the lightning is striking the ground and I’m still doing an outdoor activity or sport, I will definitely take your advice that you state in this article. thank you for sharing this. Hopefully, you are able to keep planning your activities well and you never have to have a close encounter with a lightning storm! This is an interesting post and a very informative one. I knew about the effect of lightning to a guy that was struck a long time ago, but I never thought of that again, until I read your article. Yes, it can be dangerous which is something we don’t think about a lot. Lately, it’s been raining so much and has been having quite a bit of lightning and thunder here and there in our neck of the wood so this tips here is something that will stay in my mind. I didn’t even know that there is a lightning position! Thank you for this great article which I will share with my kids as they are the adventurous ones. Please share it with anyone who needs it. The more we all know about safety the better it is for everyone in the outdoors. Thank you for sharing this informative article which I finished to read just now, and two memories struck up. The first one is the descriptions of lightning in the physics textbook which I read at least 20 years back when I was in 12th standard. The second one is pretty horrible. We were in the middle of the sea on a small boat with 5 friends, just for adventure on a trip. The location was offbeat and no coastguard, no weather report was available. The weather suddenly changed when we were in the middle, and lightning started (though far from us). I know that only god saved us that day. Anyway, I really like the way you described the lightning in your article, especially the precaution part. Thank you. I’m glad you were safe out on your boat, and that the lightning didn’t get too close! I am an Indian. At least 2,000 people have died in lightning strikes in India every year since 2005. Lightning makes havoc in our subcontinent every year. Even my younger sister has some hearing loss because of lightning. This article has been very helpful in highlighting the dangers of lightning strikes and thunderstorms. Thank you for writing in simple language that anyone can understand. It’s worth keeping in mind this collection of information and checking back to review it often. Thanks for commenting. Hopefully, we can all take precautions and stay safe out there.